Imagine getting dressed for your own event without worrying about any aspects of the food; from shopping, preparation, cooking and serving – even to clearing away and washing up. Sounds like dinner party heaven to us, so we popped over to chat with Nick Collins, Chef and Founder Director of Grate Catering and The Pickled Radish, Laleston (and participant in BBC Masterchef, The Professionals). Please tell us a bit about your background Nick. What led you to setting up The Pickled Radish and Grate Catering? I started out in the kitchens of Le Manoir aux Quat’Saisons for Raymond Blanc at a young age. This gave me a real insight into the attention to detail and what it takes to achieve perfection. My experience encompasses working in restaurants, gaining 2 AA rosettes in a country house in the Vale, catering for celebrities in a ve storey luxury chalet in Courchevel 1850, and cooking on a super yacht in the Antibes. 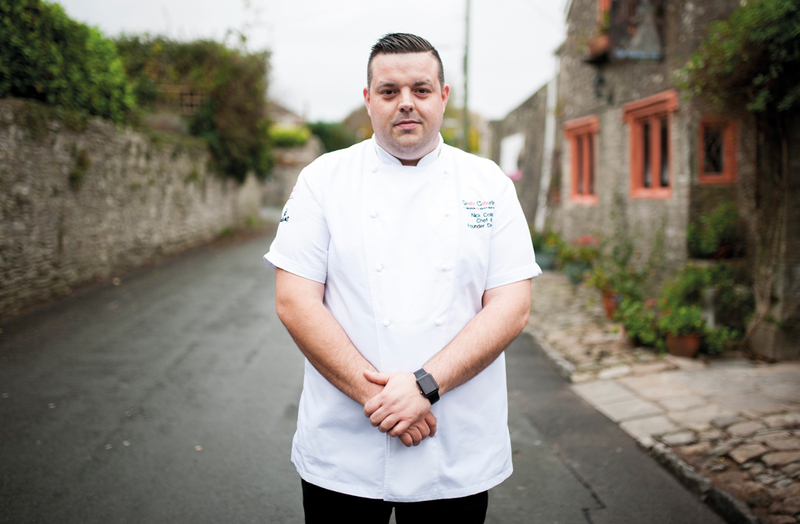 Following all of this I became a development chef for a national contract caterer, however driving around the UK all week took its toll so I decided to base myself in my home country of Wales and, seeing a gap in the market for high end ne dining, Grate Catering was born. Looking for a kitchen to base myself in, I found the Laleston Inn and so I launched The Pickled Radish there. Business grew quickly and we realised we needed another kitchen to keep up with demand, so we took on a unit in Caerphilly and built a state-of-the-art production kitchen there. I’m delighted that this has just been awarded five stars from the council, as has our restaurant in Laleston. We will cater for any event. We excel at weddings, taking our time with the bride and groom to discuss what they want and bring their dreams to life. We have a large team of chefs, all from a rosette or Michelin standard background. We also cater for many corporate clients around Cardiff and the Vale who have private lunches, dinners, and canapé parties or working lunches. We serve our food in a fun way which will bring a smile to their day, and we take pride in our food being nutritional, seasonal, and of course homemade. We’re currently focusing on contract catering, so look out for that launching in the workplace in 2016. I have instilled the ethos in my team that our food must not only be local, but it has to be excellent and local. There’s no point having poor quality meat just because the butcher is in your village. We are blessed in having amazing suppliers; our butcher, The Farmers Pantry, are some of the best butchers I have ever come across – the meat is always perfect, and local to their farm in Llantwit Major. We aim to use everything Welsh in our business from our our which comes from Talygarth Mill to our oil – we only use Welsh pressed rapeseed oil, from Blodyn Aur, which has some amazing health bene ts. What are the advantages of using a home catering service? There are so many bene ts, the main ones being that it’s time saving and stress free. Having a private chef to cook and serve for you has that wow factor, and can cost less than eating out at a restaurant. We arrive with all the food prepared and finish it off in your kitchen and then clean up like we were never there. We also have amazing front of house staff to serve our clients which adds to the experience. Sounds lovely, and something we’d love to experience. In the meantime, what’s happening at the Pickled Radish over Christmas? Throughout December we have a festive themed three course menu for £29 per head or a ve course taster menu for £45 per head. Also, we will be open on Christmas Day for our Christmas taster menu experience which is a celebration of everything Christmas could possibly throw at you. Our events team are also busy with some large private dinners in December; one for Max Boyce, and some pheasant shooting parties on a luxurious private estate in the Brecon Beacons. Our events chefs will also be at out on Christmas Day catering at some private homes around Wales. What’s the most unusual event you’ve catered for? That was a wedding where our clients wanted 100% black and white themed food. It was a challenge but it actually looked very elegant. And last, but not least, if you could cook for anyone, who would you choose to cook for – and why? I’d like to cook for Gordon Ramsay, maybe at his home, and with no cameras to see what he would make of my dishes.